Still don’t know what to get the motorcycle rider in your life? 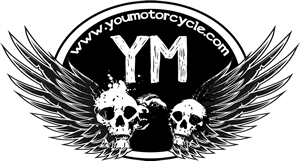 Maybe the only thing you know about motorcycling is that it can be an expensive hobby, and you aren’t even sure you can afford a motorcycle gift. Well, that’s not true, and these practical gifts are all at a price that will make you feel smart buying, and look smart gifting. The truth is, a motorcyclist would benefit from having any of these 7 gifts for motorcyclists, so whatever you get is sure to be appreciated. Happy shopping! This cover has it all. Weatherproof and waterproof protection will keep a motorcycle safe from dust, rain, and UV rays. Vents help to avoid moisture or condensation that could lead to rust down the road. Heat-resistant panels to keep the motorcyle exhausts from burning on the cover. Space for locks, grommets, hooks, and elastic edges will allow you to make it fit your motorcycle with ease while keeping it all safe. Bonus: There are three sizes to choose from, if you aren’t sure what to pick, leave a comment and I’ll let you know. You could find a cheaper motorcycle cover, but it won’t be anywhere near as good as this one, so my advice is to spend the extra $10-20. 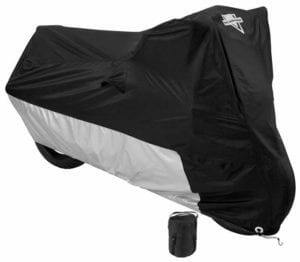 At $35, this deluxe motorcycle cover is a steal. Two of a motorcyclist’s favorite possessions are his/her bike, and their phone. In an age where we all have data packages on our phone plans, the phone doubles as a GPS tool and safety device for motoryclists, and that makes this another totally cool utilitarian gift. Yes, it costs $24. Yes, there is a cheaper option on Amazon, but this one offers a lot more security for your phone. Not only do you have more adjustable options and easy installation, but you have the ability to easily switch it over to work GoPro cameras. 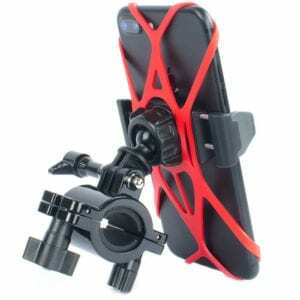 If your favorite motorcyclist isn’t already filming their rides, they might start doing that, and this mount will be handy for that too. There are three very specific reasons that I chose this particular kit. First of all, since 1901, Meguiar’s has been making the sexiest machines in the world look like a million bucks. That’s over 117 years of experience making planes, trains, automobiles, and now motorcycles look the absolute best they can look. 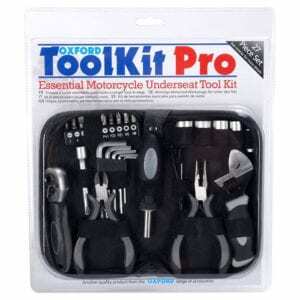 The second reason I wanted this kit in my gifts for motorcyclist list is because of all of the stuff you get in it. No need to try to get one generic cleaner. This kit has separate products for plastic, leather, and metal. Then, in addition to that, you’ve got a spray and rinse, a detailer, a wax, and a towel. 7 pieces in total. The third reason I chose this kit is the $28 sale price. Even at the regular price of $39, you’re getting a lot of product for your buck, but on sale, as a gift for someone who takes pride in their motorcycle, you can’t go wrong. While motorcycles are infinitely more fun than cars, they aren’t always more practical. There is one thing that can help level the playing field though, and it costs less than a Baconator combo. 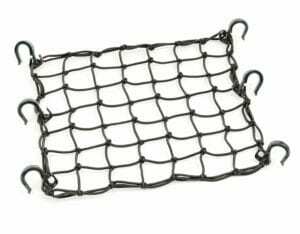 When it comes to cheap, practical gifts for motorcyclists, nothing beats a cargo net. A cargo net allows motorcyclists to strap down stuff to their back seat. I used to use them to bring home 24-packs of beer on my motorcycle with ease. If they can handle a 2-4, they can handle just about anything. Some people like to get them in whatever color their motorcycle is, but honestly, it usually doesn’t perfectly color match, so I always buy them in black. I have a few and they always come in handy. For less than $10, it’s an easy stocking-stuffer. 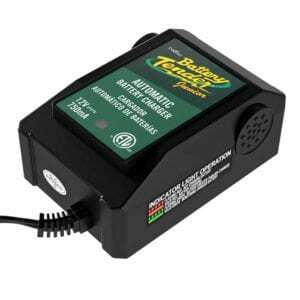 A trickle charger keeps a motorcycle’s battery charged, without overcharging, even if you leave it plugged in all winter long. In fact, that’s what it’s made for. Plug it in, and forget about it. Battery chargers help extend the life of motorcycle batteries by keeping them in an optimum state, rather than letting them drain which can hurt the overall life of your battery. A charger costs a fraction of what replacing a battery in the spring time does, and these things last forever, making them the gift that keeps on giving. And now the industry standard Deltran Battery Junior is half off, only $19, so get it while the sale is on. This one might get me to catch some fire in the comments section. That’s because usually in motorcycling, one-size-fits-all really means one-size-fits-none. So here’s the deal, this $29 emergency roadside toolkit isn’t guaranteed to be 100% compatible with every bike, however, it’s a great starting point. It’s small enough to fit under your motorcycle’s seat, and it will sure beat being stuck on the side of the road without having these tools available. Bonus point: The motorcyclist who gets this kit as a present can always take out the pieces that don’t work, buy a few odd ball sizes to fit his or her bike for a couple dollars here and there, and make the kit their own. Yes, we’re entering 2019, and everything is digital. We live in an era where point-and-shoot cameras have been rendered irrelevant by our cell phones. We take hundreds, maybe thousands of pictures, that we never see or touch without the light of a screen. When’s the last time any of us took a picture of a magical moment, and printed it out, and put it up on a wall? The fact we live in a digital world is exactly why these cameras will be the stand-out gifts for motorcyclists over the holidays. You take photos like a normal digital camera, and then print them out and share them with the people you love, like a classic Polaroid. 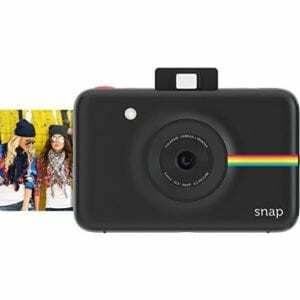 Bright colors, high-quality photos, no cables, no printers, no ink cartridges. Point, smile, shoot, print. Our motorcycles make us smile about a million miles a minute. Why not give a gift that captures that? At $88, it’s the most expensive item on the list, but it’s the one item in our list of gifts for motorcyclists that can make a second last a lifetime, so it’s worth it. Thanks for making it all the way down to the bottom of the list. I was really excited to share this stuff with you, because for $235 you can grab one of every single item on this list, or cherry pick one or two based on your budget. There’s a lot of value packed in here. COMMENTS: What are you getting the motorcyclist in your life for Christmas? Would you want to spend more or less than $100? Ho! Ho! Ho! It’s me they’re buying for! Good list though Adrian!